Neglect of stadium conditions, lack of concern for the welfare of working-class football fans and — specifically — woeful dereliction of duty by South Yorkshire Police on the day all led directly to one of the world's worst football tragedies. However, the police sought to blame the fans themselves — and were infamously backed by outrageous coverage in Rupert Murdoch's Sun tabloid. The Sun published slanderous lies about alleged misbehaviour by fans, including looting the dead and assaulting police who were seeking to assist the injured. It sparked a huge boycott of the paper in Liverpool, which still has a strong impact 27 years on. This victim blaming has now entirely unravelled. 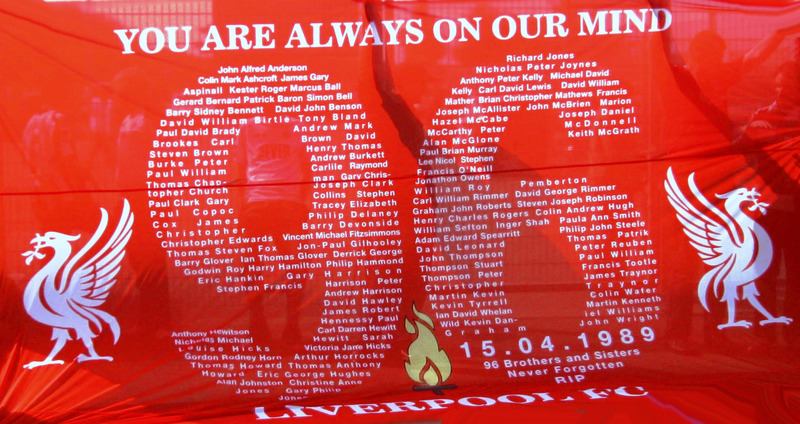 In a landmark ruling on April 26, a jury in an inquest into the disaster found the 96 fans were “unlawfully killed”. Former South Yorkshire Police commander Chief Superintendant David Duckenfield was ruled to be "responsible for manslaughter by gross negligence" due to a breach of his duty of care. British Prime Minister David Cameron said the ruling was “official confirmation” the fans were “utterly blameless”. Below is an article by John Wight reposted from the Morning Star on the inquest ruling and the establishment campaign against the victims. The victory of the Hillsborough families in their long struggle for justice was won against an establishment that viewed them and their loved ones as nothing more than scum and which, make no mistake, continues to do so today. Harsh words, perhaps, but true nonetheless. For at the very core of this scandal is the issue of class and the legacy of then-prime minister Margaret Thatcher. Throughout the 1980s, her government waged war against working-class people and communities, and sought to destroy the bonds of solidarity that provided them with their strength and pride in who they were. Along with the miners' strike of 1984-85, Hillsborough stands as an indictment of Thatcher's legacy and a Tory establishment — New Labour included — that regards working people and their lives as eminently dispensable. Into this mix belongs the now discredited South Yorkshire Police, whose leading officers in the wake of the disaster engaged in a conspiracy to distort and cover up the evidence to deflect responsibility onto the supporters. And then we have The Sun, owned by the execrable Rupert Murdoch, a man whose role in disfiguring British society these past three decades, via his newspaper empire, should never be forgotten or forgiven. Kelvin MacKenzie, the man responsible for that infamous Sun front page defaming those who died and their fellow supporters, should be made to crawl at the feet of the families today. There are no words available to express the enormity of the scandal of Hillsborough. It was an entirely avoidable and man-made disaster that occurred at a time when football had become one of the last repositories of working-class identity. On a Saturday, the terraces were a place people could still congregate to experience the solidarity and oneness that, by 1989, had all but been ripped asunder. It had been destroyed in service to the “new Britain” dominated by the City of London, property developers, entrepreneurs and all the other accoutrements of the greed and individualism at whose feet society had been conditioned to genuflect. In this regard, the tribute paid to the Hillsborough families and campaigners by David Cameron has to be considered an act of cynical opportunism. This is a man for whom Thatcher and everything she stood for represent all that is good, while the Liverpool football supporters at Hillsborough, the miners and the working class in general represent all that is bad. His government has continued the work Thatcher began with the vigour of men and women on the same mission to purify working-class people with pain. Over the past 27 years, the Hillsborough families have been one of the few islands of decency in the swamp of corruption, greed and mendacity that underpins British cultural values in the wake of Thatcher. Those values are the values of Eton and Oxbridge, of those happy to see the benefits of poor people cut while they avoid tax by salting their wealth away in tax havens. They are the values of a class and establishment that knows the price of everything and the value of nothing. At times, the prospect of the people who have fought a relentless campaign for justice for their loved ones seeing anything approximating justice must have appeared bleak. The damage to health, families and marriages cannot be underestimated — nor the sense of being treated as an irritant at best by various government ministers, officials and the police. Thatcher's former press secretary, “Sir” Bernard Ingham, is a case in point. In a letter he wrote to one of the relatives of the victims of Hillsborough, Ingham said: “Who if not a few tanked up yobs who turned up late determined to get into the ground caused the disaster? The 96 who died and 766 who were injured on that awful day in April 1989 were the victims of a monumental policing failure and an attempted cover-up in the aftermath. They were not killed by fellow supporters, nor were their bodies desecrated, violated or in any way criminally interfered with by their fellow supporters. On the contrary, many of those fellow supporters lost their lives and many more were injured trying to save others. Many who survived only did so because of the selfless actions of others on that day. Their courage stood in stark contrast to the actions of the police, who refused to open the gates in the fence in the face of the disaster that was unfolding before their eyes. The fans were viewed as human animals and treated as such on the day and for years afterwards by the likes of Ingham, a despicable human being by any objective measure. The fact he refuses to apologise for the disgraceful sentiments he expressed in his 1996 letter is evidence that he views this verdict not as a deserved victory for justice, but a defeat of everything he believes in as a disciple of Thatcher's Britain. That Britain, which has delivered so much misery to so many people over so many years, has just been found guilty.